Powers/Abilities: Able to switch between being solid and insubstantial. Able to turn invisible. Some limited time travel capability. Able to summon historical and mythological figures to assist him by saying the word "Eternity". History: "Kid" was a young man working on his grandfather's ship when a torpedo from a U-Boat sank it, killing him. However when he and Gran'pa arrived in Heaven, a problem arose. Although his grandfather was allowed to enter Heaven, Mr.Keeper, the gatekeeper of the Afterlife, informed "Kid" that he had accidentally died some seventy-five years before his time; as such, he was allowed to return to Earth, accompanied by Mr.Keeper. Back in the mortal world, "Kid Eternity" (as he was now known) would be empowered to carry out good deeds using his new supernatural powers; he could turn ghostly insubstantial or solid at will, and could call on help from figures throughout history or even fantasy/myth. Among his enemies was Master Man, a Nazi who worked for Satan and could summon evil historical figures such as Torquemada, Benedict Arnold, Batu Khan, and Rasputin by calling out the word "Stygia". Comments: Created by Otto Binder and Sheldon Moldoff. 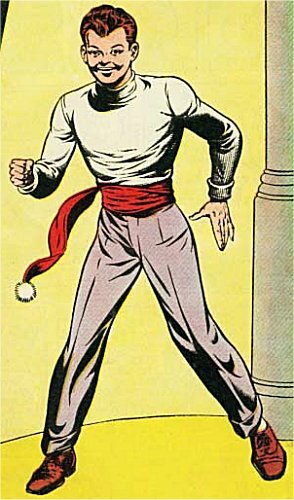 The character debuted in Hit Comics #25, and lasted there until #60 (September 1949); in addition he enjoyed his own title between Spring 1946 (Kid Eternity #1) and November 1949 (Kid Eternity #18). 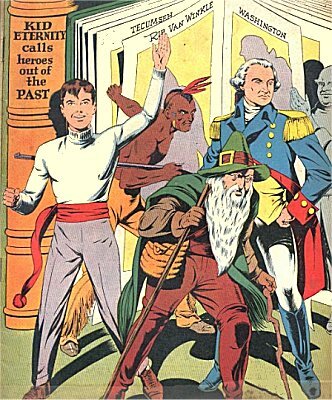 After being added to D.C.'s stable of characters, in the 1970s Kid Eternity was made a supporting character in Shazam!, working alongside Fawcett Comics' Marvel Family (and made a relative of Captain Marvel Jr.). This relationship was either eliminated or simply forgotten following the events of the Crisis on Infinite Earths, which reset many characters' continuities. As Josh Geren informs me "In the late 80's Kid Eternity returned under the DC comics Vertigo banner as a supernatural being." Grant Morrison tied the character in with the Lords of Chaos and Order, powerful higher beings.